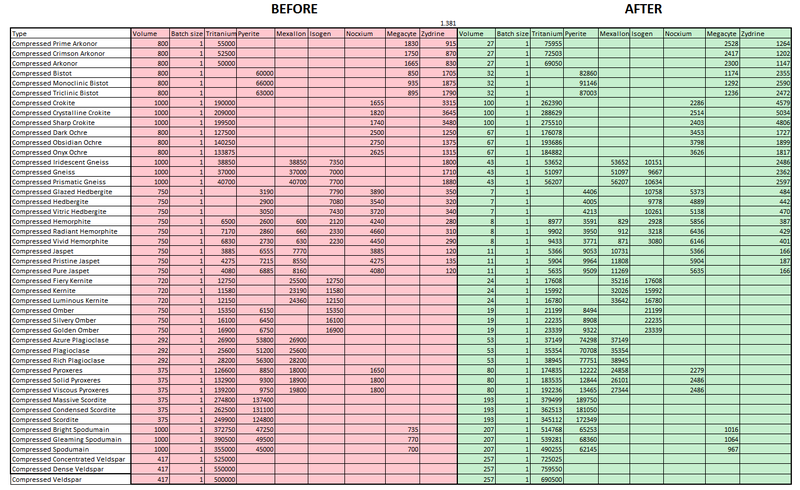 As mentioned in our “reprocess all the things” blog, we are revamping Starbase Reprocessing Arrays for Crius. Those will now provide much better reprocessing abilities. Below are their exact attributes. Ore, ices and gas clouds may now be mixed together at the same time inside the structures – but modules cannot be moved inside the Reprocessing Arrays. 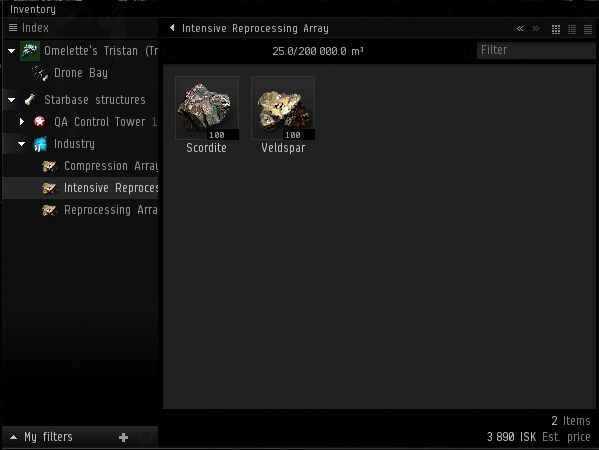 Reprocessing is done via a simple right-click > reprocess option, which of course can be used on multiple ores at once. The Intensive Reprocessing Array may only be used in low-security solar systems and below. The standard Reprocessing Array, meanwhile, may be used everywhere, including 1.0 security systems. Instead of requiring various amounts of ore to compress as expressed here, compression now requires 100 units of the base ore to deliver one unit of compressed variation. 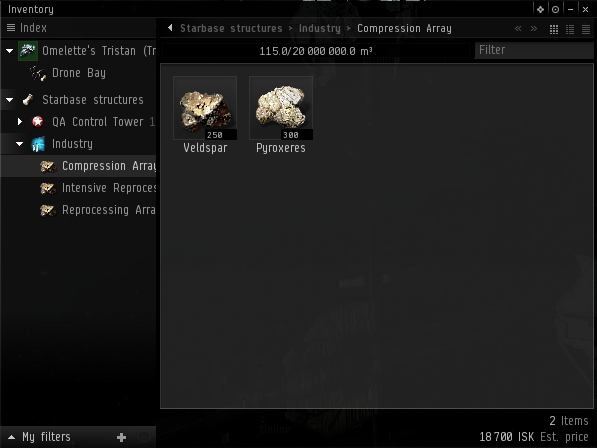 Volumes on compressed ores have been tweaked to preserve the same ratios as mentioned in our “reprocess all the things” blog, so the ratios shouldn’t change. Compression blueprints are being removed and properly reimbursed. Example: I have 100 units of Veldspar in the Compression Array with a total volume of 10m3. After compressing them I will receive 1 unit of Compressed Veldspar with a volume of 0.15m3 (this may displayed as 0.2 in the client due to how rounding works). 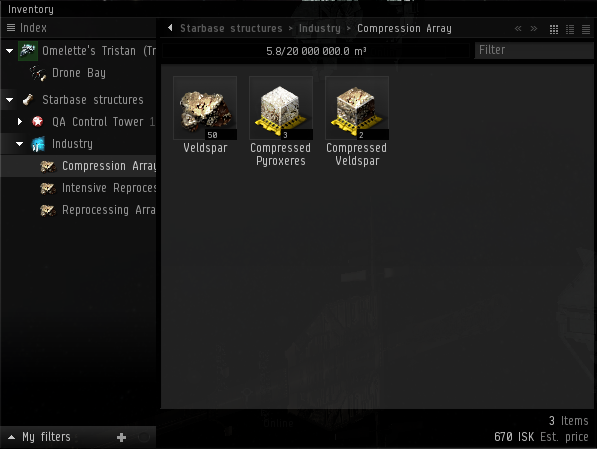 Secondly, we are introducing a Starbase Compression Array. With perfect reprocessing rates being no longer achievable, this structure becomes quite important to faciliting the movement of ore. Here are the attributes. Compression is done via right-click and may be used on multiple selected items at once. 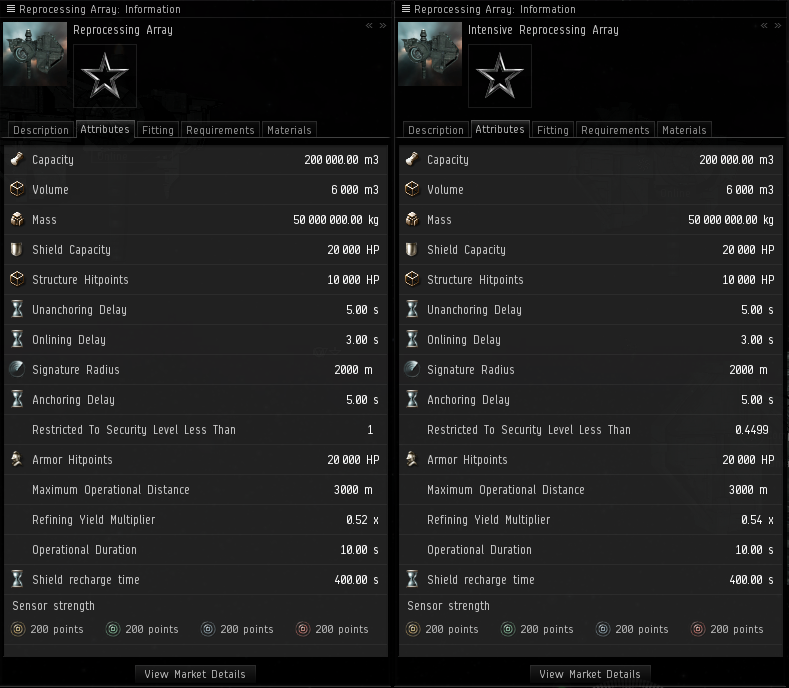 As explained in “the Price of Change”, manufacturing and science slots are going away, to be replaced with a cost scaling system. While Starbases will be subject to the same global formula, use of them won't suffer taxation as NPC stations do. Another drastic change is that blueprints safely stored in a regular station can no longer be used for jobs in Starbase structures. Players will still be able to remotely start Starbase jobs from several solar systems away, but the blueprints will now have to be physically available in the structure for it to properly start. 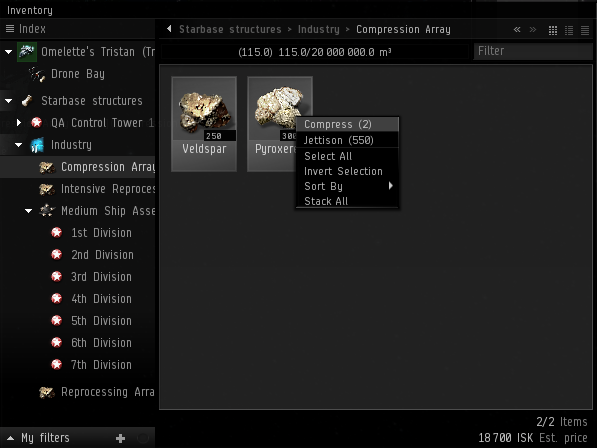 Removing slots from industry jobs discourage players from stacking more than one Starbase structure of the same type at a Control Tower. To counteract this point, we are going to give specific bonuses when Starbase structures of the same type are stacked together at the same control tower. This bonus is going to be a flat reduction on the whole job cost price, whose amount and total bonus varies depending on the Starbase structure itself. In practice, this means that stacking 13 Medium Ship Assembly, Advanced Medium Assembly or Subsystem Assembly Arrays will reduce the total cost to start a manufacturing job at any of those structures by 26%. Those bonuses are not system wide, which means that structures at two different locations inside the same solar system will not stack together. Control Towers will no longer require faction standings to be anchored in high-security space. Moreover, Control Towers will now be anchorable in previously restricted solar systems like 0.8 and above. Newly formed corporations will need to wait 7 days before being able to anchor Starbases. 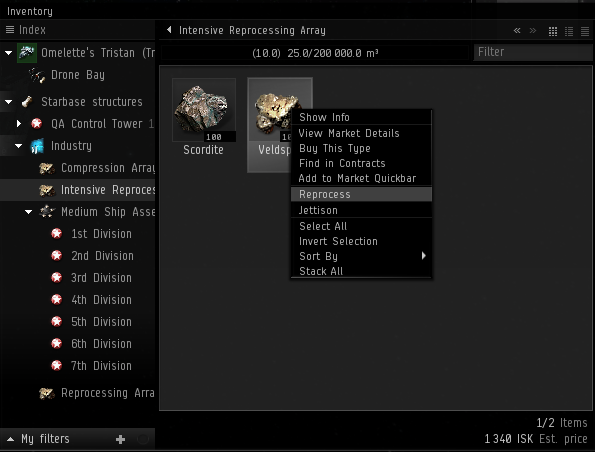 This is to inhibit players from immediately moving Starbase assets to another corporation if under a war declaration. Mobile Laboratory has been renamed Research Laboratory. Advanced Mobile Laboratory has been renamed Design Laboratory. Hyasyoda Mobile Laboratory has been renamed Hyasyoda Laboratory. Time multiplier for Research ME: 0.7 (was 0.75). Time multiplier for Research TE: 0.7 (was 0.75). Time multiplier for copying: 0.6 (was 0.65). Time multiplier for invention: 0.5 (was 0.5). Time multiplier for Research ME: 0.65 (was 0.75). Time multiplier for Research TE: 0.65 (was 0.75). All assembly arrays receive a 2% material reduction to manufactured products (except for the Drug laboratory, Subsystem System Array, Rapid Equipment Assembly Array and Supercapital Assembly Array). Assembly Arrays will keep their 25% time reduction. 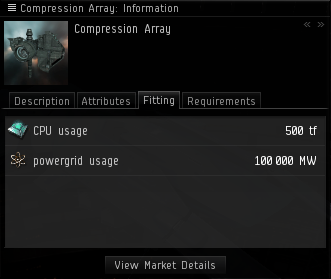 Advanced Assembly arrays no longer 10% have material waste. They now all have 2% material reduction like their regular counterparts. Rapid Equipment Array material waste now is 5% instead of 20%. X-Large Assembly Array is being renamed Capital Ship Assembly Array to better reflect what it actually does. 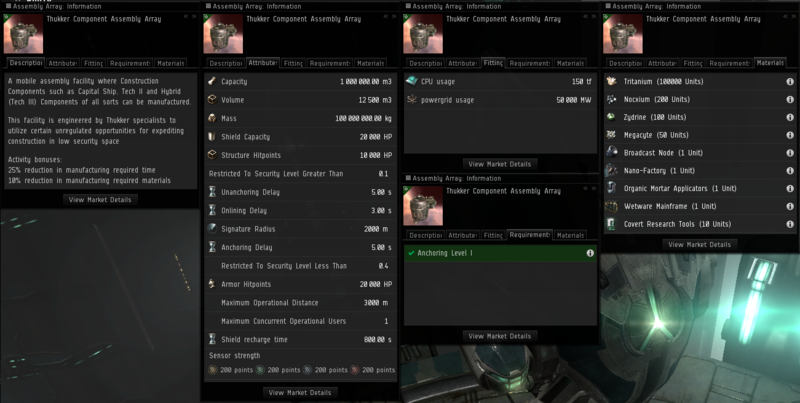 Capital Assembly Array is being renamed Supercapital Ship Assembly Array for the same reasons. Corporate Hangar Arrays: from 1,400,000 m3 to 3,000,000 m3. Ammunition Assembly Array: from 150,000 m3 to 1,000,000 m3. Component Assembly Array: from 1,000,000 m3 to 1,500,000 m3. Drone Assembly Array: from 150,000 m3 to 1,000,000 m3. Equipment Assembly Array: from 500,000 m3 to 1,000,000 m3. Rapid Equipment Assembly Array: from 500,000 m3 to 1,000,000 m3. We are modifying how Material Efficiency (ME) reduction works on materials. Instead of being applied on individual runs, they will now apply to a whole job. That means that manufacturing a large batch of items will still give some reduction on Assembly Arrays instead of being simply negated. We will be rounding up to the next significant digit, which means that 14.4 Tritanium required to manufacture 10x cheap-quality holoreels will actually be rounded to 15. Whole and single items will not be affected by this calculation. This is most relevant for Tech I items required to manufacture Tech II variations. For example, building 10 Paladins will not require 9 Apocalypse if you have a 10% ME. As we mentioned some time ago, we are also going to introduce a new type of Component Assembly Array to help low-security Capital ship builders to compete with the reprocessing changes. This structure will give 25% reduction in manufacturing time, 10% reduction in manufacturing required materials and may only be anchored in low-security solar systems. It may only be used to build Capital Construction Components and Advanced Capital Construction Components. We are changing the Starbase Defense Management skill to only require Anchoring at 4 instead of 5, in order to ease entry of access into Starbase manual control. The Supply Chain Management and Scientific Networking skills are also receiving some small changes. Currently you need level 1 to be able to either start Manufacturing or Science jobs in the solar system the blueprint is in, which each subsequent level increasing starting distance to 5 jumps, with level 5 giving you full regional control. We are modifiying those so that starting local jobs in the same solar system the blueprint is in doesn't require any skill, while each level of Supply Chain Management and Scientific Networking increase job starting distance by 5 jumps, up to a total distance of 25 jumps. This reduces dependency on region boundaries which may actually be closer than 25 jumps in some cases. As mentioned in this thread, since blueprints cannot be remotely using Starbase structures, the whole appeal of this functionality is greatly reduced. As such, we are removing it to reduce confusion as a whole – this will be added back when we get to fully revamp Starbases in the future. We hope this will shed some light on the various changes coming to Starbases in the Crius release on July 22nd and help you make the right industrial decisions before its goes live.